Yes we need a picture. And yes we need to carry on with the garden. There is still very much to do. The driveway project got in the way of garden tasks. The seeds for this year’s plants need to go through the final sorting and get planted. And there are a few more plants that need to be moved to their summering spot. Right now they are sitting above ground waiting to be planted. And there are a few last new plants still on their way here to the garden. Which means that when they arrive a small game of musical chairs will ensue. One plant will have to come out and the new arrival will get planted there. The other plant will stay in the garden, most likely in a less choice spot. Then there are the new name tags to make for the new plants and the keeper seedlings. And a few other dozen tasks that need to be done…. carry on ! In the mean time a picture of a seedling and its parents. The seedling…. and the parents, Fol de Rol and Prague Spring. This entry was posted in Brown, daily post, daylilies, daylily blog, flowers, gardens, life, nature, perennials, pink, red, serenity, summer, yellow and tagged blog, blog daylily, blog gardens, bloom, daylilies, daylily blog, daylily image, Daylily sites, flower blog, flower image, flowers, Fol de Rol, garden blog, gardening, gardens, hemerocallis, life, nature, perennial, perennial plants, Prague Spring, seedling, serenity on May 27, 2013 by John Hric. Talking of pictures, am I the only person who is curious to see a snap of the bigger picture? 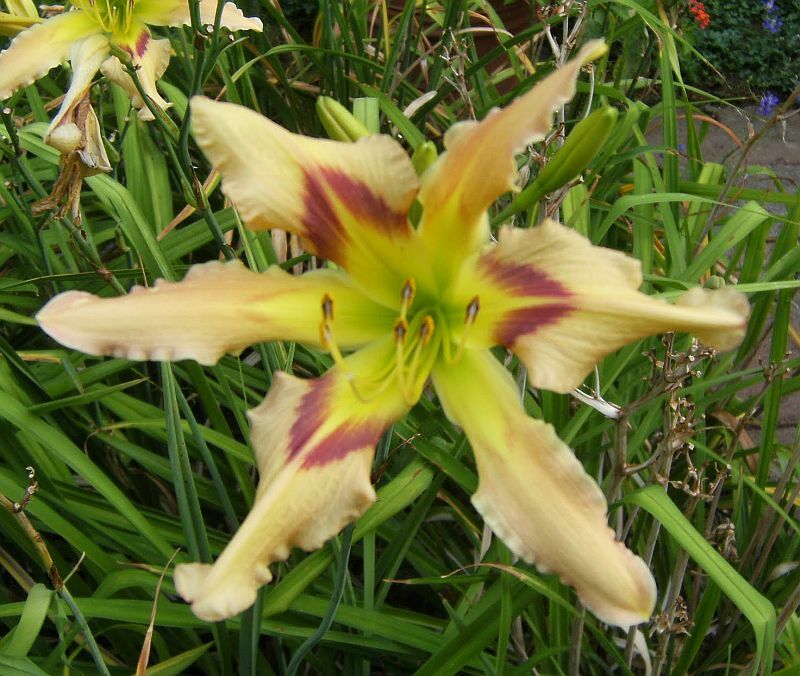 I’d love to see the line-up of your day lily nursery one day – if we behave, can we see? Pleeease? WOW, that is just beautiful 😀 THANK YOU! By “nursery”, I was using a non-horticultural take on the place where you keep your babies…. You seem to be as much a parent as a horticulturist, form what I can gather! I really enjoy your blog, even though I know nothing about plants and have a very bad relationship with anything green that doesn’t go directly into my plate. I am in the middle of writing a post about the topic- do you mind if I mention you in it? The special symmetry of a flower is something that has always fascinated me. I agree. Thanks for your thougts Robert ! First, I am impressed by your “back yard”, which is probably bigger than the entire lot my house sets on! Simple breathtaking! Now then, this seedling is amazing! While it reminds me of one of Bob Wilson’s intro’s (NEWBOLD NAVAJO FEATHER), this one of yours is more sophisticated, no doubt due to FOL de ROL, another long wished for and never attained spider. Shows how well my memory works! But then at my age a lot of things remind me of other things (people and places as well) that I have seen before! Rebecca, Bob’s NEWBOLD NAVAJO FEATHER is an awsome looking bloom. As for my Prague Spring x Fol de Rol it is what it is. Pretty yes. I don’t think the bloom is over 6 inches and it gets its height from Prague Spring. While this is from memory and not from measure put it about 26 inches. The Fol de Rol genes may take it back higher next generation. Will have to wait and see. All that said I am glad you like it. And in closing – I hear your complaint. No matter where: space the final frontier…. especially for daylily growers. …now to find another picture. Thanks MM ! I will gladly take the extra publicity ! Glad you enjoy the blog.